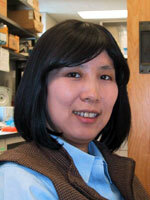 Hua Lou received a Ph.D. in Plant Molecular Biology at the University of Illinois at Urbana-Champaign in 1993. After a postdoctoral fellowship at the University of Texas M.D. Anderson Cancer Center working with Dr. Robert Gagel, Dr. Lou moved to Baylor College of Medicine to work with Dr. Susan Berget as an Instructor, where she continued her work on alternative splicing. Dr. Lou joined the Department of Genetics in 2000. The research focus of my laboratory is to understand alternative pre-mRNA splicing in mammals: its biological role and the molecular mechanisms that regulate alternative splicing. We are specifically interested in regulation of alternative splicing in neurons and heart tissues under both normal and pathological conditions. We combine genetic and biochemical approaches and use several model systems in our studies. Alternative splicing plays an important role in the function of the gene product of the tumor suppressor gene neurofibromatosis type 1 (NF1). Exon 23a of the NF1 pre-mRNA is an in-frame exon encoding 21 amino acids in the NF1 GTPase-activating protein (GAP) domain. This exon is alternatively included, producing two NF1 isoforms. The type I isoform does not contain this exon, while the type II isoform does. The ratio of the two isoforms varies in different tissues and during development. The type I isoform is predominantly expressed in neurons of the adult central nervous system and shows ten times higher activity in down-regulating Ras activity than the type II isoform. To determine how changes of NF1 alternative splicing affects the role of NF1 in development, we generated a mouse model in which the ratio of the two NF1 isoforms is drastically altered. By studying the phenotype of the knock-in mice, we will gain insight into regulated exon 23a expression in the development and function of the nervous system. Our previous studies demonstrate that alternative inclusion of exon 23a is controlled by at least four groups of RNA-binding proteins, TIA-1/TIAR, Hu (also known as ELAVL), CELF and MBNL proteins. In addition, we discovered that the selective inclusion of NF1 exon 23a could be regulated at the chromatin level. Recently, a number of genome-wide analyses indicate that for most eukaryotic genes, transcription and splicing are tightly coupled. This tight coupling of transcription and splicing predicts that alternative splicing choice can be regulated by histone modifications, chromatin structure, as well as transcription elongation rate. Our recent studies establish that epigenetic changes induced by environmental cues, such as increased calcium levels, affect alternative splicing of NF1 exon 23a through altering transcriptional elongation rate. Currently, we are investigating if and how splicing pattern of exon 23a changes dynamically in normal brain functions such as learning and memory. Neurofibromatosis type 1 alternative splicing is a key regulator of Ras/ERK signaling and learning behaviors in mice. In Vitro Analysis of Ribonucleoprotein Complex Remodeling and Disassembly. Histone hyperacetylation and exon skipping: a calcium-mediated dynamic regulation in cardiomyocytes. Calcium-mediated histone modifications regulate alternative splicing in cardiomyocytes. Neurofibromatosis Type 1 Alternative Splicing is a Key Regulator of Ras Signaling in Neurons. Regulation of alternative splicing by local histone modifications: potential roles for RNA-guided mechanisms. The p97-UBXD8 complex destabilizes mRNA by promoting release of ubiquitinated HuR from mRNP. All three RNA recognition motifs and the hinge region of HuC play distinct roles in the regulation of alternative splicing. Alternative splicing of the neurofibromatosis type 1 pre-mRNA is regulated by the muscleblind-like proteins and the CUG-BP and ELAV-like factors. Alternative splicing of the neurofibromatosis type I pre-mRNA. Hu proteins regulate alternative splicing by inducing localized histone hyperacetylation in an RNA-dependent manner. Wang H., Molfenter J., Zhu H., Lou H.
The neurofibromatosis type I pre-mRNA is a novel target of CELF protein-mediated splicing regulation. Repression of prespliceosome complex formation at two distinct steps by Fox-1/Fox-2 proteins. Diverse molecular functions of Hu proteins. Regulation of Neuron-Specific Alternative Splicing of Neurofibromatosis Type 1 Pre-mRNA. Role for Fox-1/Fox-2 in mediating the neuronal pathway of calcitonin/calcitonin gene-related peptide alternative RNA processing. Hu proteins regulate polyadenylation by blocking sites containing U-rich sequences. U1 snRNP-dependent function of TIAR in the regulation of alternative RNA processing of the human calcitonin/CGRP pre-mRNA. Alternative ribonucleic acid processing in endocrine systems. Polypyrimidine tract-binding protein positively regulates inclusion of an alternative 3'-terminal exon. Alternative RNA processing--its role in regulating expression of calcitonin/calcitonin gene-related peptide. An intron enhancer recognized by splicing factors activates polyadenylation.